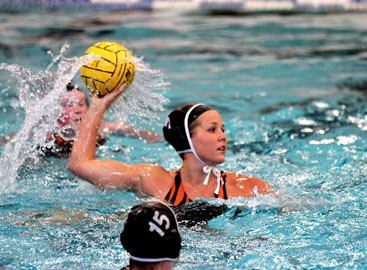 AIMING HIGH: Sophia Monaghan prepares to unload the ball in action for the Tiger Aquatics water polo club team. The Princeton resident and former Lawrenceville School standout has had a busy summer. She coached and starred for the Nassau Swim Club Lemmings, winning two titles at the Princeton Area Swimming and Diving Association (PASDA) championship meet in late July. After completing that season, she headed to California where she helped her Tiger Aquatics team take 9th in the gold division at the Junior Olympics. Now she is preparing to start her freshman season with the Stanford University women’s water polo team. For Sophia Monaghan, coaching was a primary focus of her experience this summer in her 10th and final campaign with the Nassau Swim Club Lemmings. “I came into this season more as a coach than as a swimmer,” said Monaghan, who guided the 10-and-under swimmers for the Lemmings. Monaghan still had time to earn cheers for swimming, taking first in both the 18-and-under 50 freestyle and 50 backstroke and placing third in the 50 fly at the Princeton Area Swimming and Diving Association (PASDA) championship meet in late July. “I just wanted to be able to swim fast and do it for fun,” said Monaghan. who graduated from the Lawrenceville School this spring and is headed to Stanford University where she will be a member of the Cardinal women’s water polo team. For Monaghan, that competitiveness manifested itself in water polo as she was a four-year starter for the Lawrenceville team and rose through the Olympic Development Program, playing for the 2012 USA Women’s Water Polo Junior team in the Under-19 Pan American Championship last summer in Montreal, Canada. After finishing the PASDA meet, Monaghan headed to California to compete with her Tiger Aquatics water polo club team in the Junior Olympics. “The team has a range of players; water polo is growing on the east coast,” said Monaghan. Playing with the national program, though, helped put Monaghan on the path to college water polo. Monaghan fell in love with Stanford years ago and was thrilled to get recruited by the Pacific 12 power. “I had wanted to go there as a school since 7th or 8th grade, it was always a dream of mine,” said Monaghan, who was a team captain for Lawrenceville and helped the Big Red go 18-1 last winter on their way to winning the prestigious Beast of the East Tournament. As Monaghan looks forward to starting her college career next month, she knows she has to raise to the level of her game. “A big challenge is seeing how I play going from east to west coast; it is a really different game out there,” said Monaghan, a 5’9 center-defender.